The important things in life are not things. Contentment is not found in how much you have, nor in how much of a surplus you enjoy. However much you have will never be enough, apart from God’s generous provision. Contentment is found in your full confidence that God is your ample provider, Jehovah Jireh. The Apostle Paul was assuring, “My God shall supply all your need according to His riches in glory by Christ Jesus.” Philippians 4:19 NKJV. Years ago, I was challenged by a quote attributed to Epicurus, an ancient Greek philosopher. “Nothing is enough for the man to whom enough is too little.” How much must a person have to be content? That is a sufficiently important question that every person needs to answer honestly and accurately. When is enough enough? Usually, the answer is, just a little more. Answered correctly, your answer can counteract a latent insecurity and subtle greed that conflicts with your desire for contentment. Insecurity whispers to all of us that we need enough, and then defines enough as more than what is truly adequate. And even when you acquire what you think are necessary resources and gather more than enough stuff, greed still suggests that you require a little more while falsely reassuring that you deserve the extra you desire. So, a never-ending cycle is created, wanting more while trying to have enough. You work to feel secure, then reward yourself with more than you need. And, the result is a futile search, a never-ending quest for more. Otherwise, your quest reduces your joy and pleasure for what you have and dampens your gratitude for what you have already received. Striving to accumulate and store more, becomes an insufficient goal for life, ultimately exhausting to the human spirit. Such a limited, material goal misdirects your heart from seeking true wealth which is always spiritual not material. Jesus said, “Lay up for yourselves treasures in heaven, where neither moth nor rust destroys and where thieves do not break in and steal. 21 For where your treasure is, there your heart will be also..” Matthew 6:20-21 NKJV. It is better to have the best of what lasts, than simply more of what is only good for the moment. More is never enough! My wise and dear friend, Campbell, advised me years ago, “The heart cannot desire what the eye has not seen.” Be selective about what holds your gaze too long, lest it fills your vision and captures your desires. God’s Word is clear, “Keep your lives free from the love of money and be content with what you have, because God has said, ‘Never will I leave you; never will I forsake you.’” Hebrews 13:5-6 NIV. What God provides will always be enough. And what is the personal reward of having enough? Gratitude. Contentment. Sufficiency. Satisfaction. Freedom from the tyranny for more. Appreciating things that money cannot buy. “Godliness with contentment is a great gain.” Read 1 Timothy 6: 6-11. I read a sign today that said, “The most important things in life are not things.” That is good to remember. God offers you a greater return, and much more enduring, than the biggest bull market on Wall Street. “For I have learned to be content in whatever circumstances I am. I know both how to have a little, and I know how to have a lot. In any and all circumstances I have learned the secret of being content – through Him Who strengthens me.” Philippians 4:11-13. It is never your wealth or possessions that provide true security and contentment. Those are found only in God. Today I pray for you to trust God, reassured that He is your source of sufficiency. Your new faith did not erase your old nature. “Given to us are exceedingly great and precious promises, that you may be partakers of the divine nature.” 2 Peter 1:4 NIV. Salvation resolves the problem of your eternal destiny. Salvation does not solve all your problems in this life immediately. That is a process of grace. So, you are a Christ-follower now. Shouldn’t everyday life become easier? Do you ever wonder if you should be further along in your spiritual growth than you are? Should you be winning new battles instead of still fighting so many of the old ones? Salvation reconciles your history and begins a wonderful new journey, but there is much more that God wants and needs to accomplish in you. God cares about your destiny. Remember when you finally realized that you could not save yourself by your good works? Paul wrote, He saved us, not because of righteous things we had done, but because of His mercy. He saved us through the washing of rebirth and renewal by the Holy Spirit. Titus 3:5 NIV. Yet it is alarmingly easy to still assume that now you can take it from here. The Bible calls those, dead works. You can no more live your Christian life on your best behavior now, than you could save yourself by your good behavior previously. You know what the problem is? Your new faith did not erase your old nature. I envision Paul rejoicing as he wrote the words, 4 Because of His great love for us, God, Who is rich in mercy, 5 made us alive with Christ even when we were dead in transgressions – it is by grace you have been saved. Read Ephesians 2:1-5 NIV. 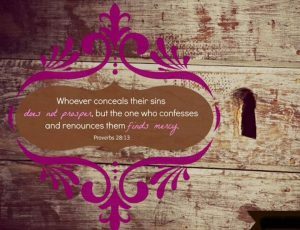 You remain vulnerable to the relentless pull of desires incompatible with your confession and spiritual convictions. And when that happens, feelings of guilt return and doubts cloud your confidence about salvation. You thought that battle was in the past, didn’t you? The Apostle Paul asked and answered the question our hearts ask, Who will rescue me from this body that is subject to death? 25 Thanks be to God, who delivers me through Jesus Christ our Lord! Romans 7:23-24 NIV. Here’s the good news! “Walk in the Spirit and you will not carry out the desire of the flesh.” Galatians 5:16 NAS. I suggest that you cannot consistently and successfully walk in the power of the Holy Spirit until you request, receive, and realize that you have been filled with the Spirit. By His Spirit, God Himself dwells within you to deliver you from your old nature, much the same as He redeemed you from your sins by Jesus Christ. See Galatians 2:20 NIV. 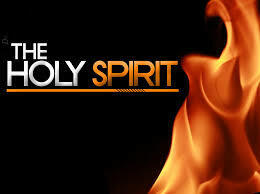 You will be better, do better, and live better when you rely upon the power of the Holy Spirit. I have heard this wonderful progression of spiritual life and growth explained this way. At salvation, you were saved from the penalty of sin. In the ongoing process of sanctification, you are being saved from the power of sin. And in eternity you will be saved from the presence of sin. The old nature will then be eradicated forever; never again will you contend with its inclination toward sin. To accomplish this, there is both an indwelling and an infilling of the Spirit. The indwelling is constant and occurs when the Spirit baptizes you into the Body of Christ. Read 1 Corinthians 12:13 NKJV. The infilling occurs at your invitation – anywhere, anytime, every time – as Jesus baptizes you with His Spirit. The Bible says, 17 Therefore do not be unwise, but understand what the will of the Lord is,18 be filled with the Spirit. Ephesians 5:17-18 NKJV. The Greek word in that verse that is translated, “filled,” describes the influence of something rather than the quantity of something. Consider this. A sail boat moves under the influence and direction of the wind when its sails become filled with the wind. Similarly, “When the Holy Spirit controls our lives, He will produce this kind of fruit in us . .“ Galatians 5:22 NLT. Live full of the Spirit; the Spirit then gives you the power you lack to forgive, be patient in trials, be loving when mistreated, trust and obey when you don’t understand, break habits, and live as your heart for God desires. As a child of God, the infilling of the Spirit does not give you more of the Spirit than already abides in you. Yielding more of yourself to live within His authority releases the Holy Spirit’s fullness and influence. See Galatians 5:24-25 NIV. Live every day, in and by the power and influence of the Spirit of God. Today I pray for you to rely every moment on the power of God’s Spirit. Life is a quest for fulfillment. “I am going there to prepare a place for you.” John 14:2 NIV. Lives are spent looking for something, often without knowing what that something is or where that could be found. The award-winning musical, West Side Story, has a lovely song, Somewhere, by Leonard Bernstein and Stephen Sondheim, in which the star-crossed lovers, Tony and Maria, sing, There’s a place for us. Somewhere a place for us, Peace and quiet and open air, Wait for us, somewhere . . somehow, some day, somewhere! Those lyrics voiced a generation’s search, maybe the yearning and quest of every heart. Some people look for safety in a place free from fear or danger, or for the promise of success with the recognition or independence that provides, or for comfort in a place free from stress or striving. Nobly, others look for meaning through a place of service and contribution where their life could make others’ lives better. Every satisfaction begins with a right relationship with God. Everyone is looking for something, or someone, to make their life full and satisfying. Purpose and meaning is what gets you up in the morning, motivates you to give your best, and keeps you going when you feel like quitting. Life is a quest, a search for personal fulfillment and completion. Some squander their lifetime looking for the right things in the wrong places, or looking for the wrong things altogether. Those individuals’ philosophy could be summed up in these words; “There is no place anything like this place anywhere near this place, so this must be the place.” Don’t settle for lesser things. Too many people settle for the next best thing. They finally accept what comes the closest to their search. But is close ever good enough, especially when that involves eternity? What are you looking for? Everything you do – your goals, choices, relationships, efforts, sacrifices – are ultimately motivated by the object of your search. Wouldn’t it be better to know what that is, or what it should be? I would suggest that this common, lifelong quest is a spiritual longing for where it all began. God created the first man and woman to have a personal, intimate relationship with their Creator, placed them in a perfect Garden, assigned them productive and meaningful service, and provided them with pleasant companionship. See Genesis 2 NKJV. Would you agree with me that everything else pales in comparison with that? Here is how this relates to you and me. Jesus said that throughout your lifetime He would be busy preparing such a place just for you, but you will never find it here and you will never find it on your own. Such a place is found in Christ alone. 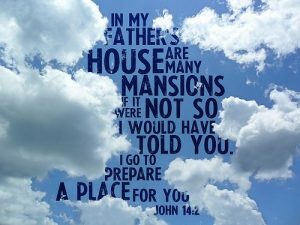 Jesus explicitly promised a place for you, “In My Father’s house are many places; if it were not so, I would have told you, for I go to prepare a place for you. If I go, I will come again and receive you to Myself, that where I am you may be also. And you know the way to where I am going . . I am the Way, the Truth, and the Life. No one comes to the Father but through Me.” John 14:2-6 NAS. See also John 3:16-21 NLT/ Romans 10:9-10 NLT. That is quite a promise, and a sobering reality, and reliably true. Our lives and future are ever secure in His hands. Deep in the heart of every man and woman there is an innate sense that the wrong place at the end of life is to be forever separated from God. If that separation is true now, it will remain true then. God put that truth deep in your spirit, so you would not waste your lifetime searching for the wrong things in the wrong places. All you need or will ever desire will only be found in Jesus. Today I pray for you to find your place in Christ Jesus and be fully at home.